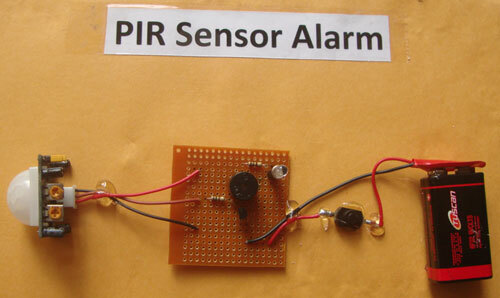 The PIR Sensor module is an assembled unit with PIR sensor, signal amplifier, presets for adjusting sensitivity range, duration of output etc. 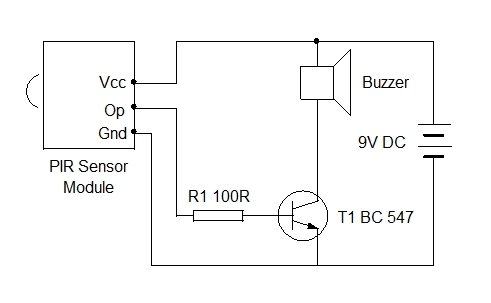 There are three connecting pins for Vcc, Ground and Output. It is marked on the module if the filter cap is removed ( pull it to remove). It works off 5-12 volt DC and the output is positive to drive the transistor. In the standby mode, the sensor sets its sensitivity by using the ambient temperature around it and the surface on which it is fixed. When a human being passes across its detecting range, the passive infrared (Heat) from the body changes the sensitivity of the sensor and its output turns high. This output is used to drive the transistor to switch on the buzzer.